This Career and Internship Fair is one of the biggest professional development opportunities offered to Ohio University students and alumni. Meet potential employers and learn about internships, co-ops, and full-time job opportunities. Aside from Prepare for the Fair events, the CLDC wants to make sure you are fully prepared before meeting employers at the Career fair. Before you go into Baker Ballroom on Tuesday, February 14th, make sure you check your attitude, attire and your actions. Go in with an open mind and a positive outlook. Do your research on the companies you really want to talk to, but discount other places because they just might have what you are looking for. If anything, you will still make a great connection. Make sure you keep a positive attitude and show each company that you are really excited to be there. After all, they are taking the time out of their week to travel here to meet people like you. Have a normal conversation to ease up the tension and show them a bit of your personality. That’s definitely a key thing they will be looking for and it’s a great way to make yourself memorable. Come looking your best. That is all there is to it. Most, if not all, of the employers will be dressed professionally and if they can do it…you should too. You are there to make a good impression and your appearance should say that about you. Business professional is the best idea for this occasion. Make sure your hair, makeup, nails, beard looks presentable. Just don’t come looking like you just crawled out of bed. 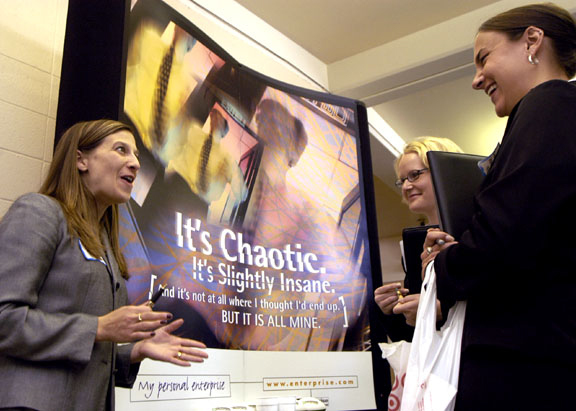 Make sure you are respectful of all Career Fair attendees, whether that be students or employers. Don’t interrupt students who are talking to employers already. Wait your turn and then make your impression when you get the chance to chat with them. Always remain professional, even when walking through the aisles. Wait until after the fair to talk about different companies because you don’t want other employers to hear you talking down another company. That reflects poorly on you. If you need to do some more research about a company, go out in the hallway and do that. You don’t necessarily want to be seen on your phone. It’s OK to take a break as needed. It will give you a little time to re-cooperate before talking to another employer. If you need any help getting prepared for the Spring 2017 Career and Internship Fair, schedule an appointment or come in for a drop in.